GRT Yamaha Official WorldSSP Team’s Lucas Mahias put in a sensational performance under the floodlights in Qatar at the final round of the season, despite being under immense pressure, to take a superb victory and become the 2017 FIM Supersport World Champion. Only needing to finish in tenth to secure the title, Mahias shook off any nerves he may have been feeling and enjoyed a stunning battle at the front, highlighting his fearless character as he went on to win the race by just 0.023s in an incredible finish to the season. In the process being crowned WorldSSP champion by a margin of 29 points, adding to the Team and Manufacturer titles that the GRT Team and Yamaha had wrapped up at the last round in Magny-Cours to complete the “triple crown’. His teammate Federico Caricasulo also enjoyed a superb race, battling with his teammate at the front before just missing out on the podium due to a lack of grip in the latter stages, crossing the line in fourth to secure fifth in the overall championship standings. Despite the pressure of having the championship on the line, Mahias had been on fire all weekend in the hot and humid conditions in the Qatari desert, topping Thursday’s practice and setting a new outright lap record on his way to securing his maiden WorldSSP pole position on Friday. If he was feeling any nerves, he didn’t show it as he enjoyed a blistering start to Saturday’s race and immediately became involved in a superb three-way battle at the front with his teammate Caricasulo and Jules Cluzel. With the championship on the line, Mahias pulled no punches and fought valiantly, even though he only need to secure 6 points to lift the title. 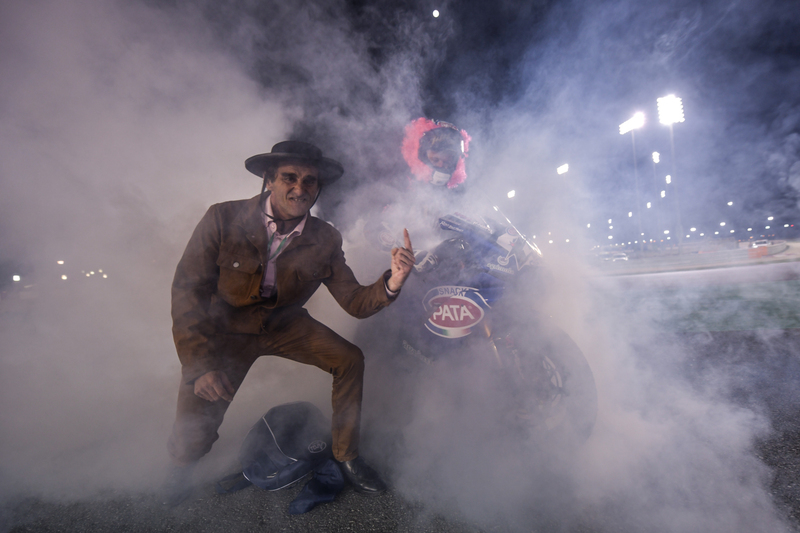 With his true racing character shining through, the 28-year-old French rider led across the line for the majority of the 15-lap race, but in the latter stages he came under heavy pressure from compatriot Cluzel. Battling fiercely right to the line on his Yamaha R6, Mahias bravely gave no quarter and in a dramatic photo finish, he took the chequered flag to secure the victory – and with it the championship – by just 0.023s. It was Mahias’ second win of the year in a season that has seen him on the podium at 8 out of the 12 races and this result meant he ended the 2017 season on top of the overall standings with 190 points, 29 ahead of his title rival Kenan Sofuoglu, to be crowned the 2017 WorldSSP Champion. His performance capped off a ‘perfect’ year for his GRT Team and Yamaha, who had already secured the Team and Manufacturers titles at the last round in Jerez. Caricasulo qualified in seventh on Friday after showing good pace throughout the weekend and when the lights went out in Saturday’s race, he shot off the line and was up to fifth by the very first corner. Charging past a number of riders, he quickly became embroiled in the excellent three-way battle at the front with his teammate and Cluzel, and was showing the kind of race pace that would see him firmly in the battle for the victory. Unfortunately, his charge through the field had taken its toll on his front tyre and in the last three laps, he started to drop off the fight for the win. Battling hard despite a clear lack of grip, he was caught and passed by Sofuoglu on the very last lap, just missing out on what would of been his fifth podium of the season as he crossed the line in fourth, just 3.845s behind his teammate. The GRT Yamaha Official WorldSSP Team have enjoyed an incredible year and will now head into the winter break full of confidence that they can defend their title in 2018.